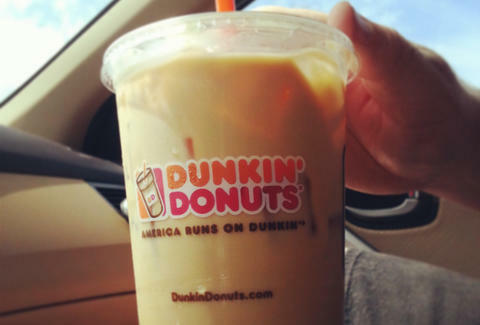 If you already can't function without an injection of Dunkin' Donuts iced coffee, good news: Dunkin' is stepping up its cold beverage game by offering actual cold-brew coffee. According to Delish, select locations in Massachusetts and Maine are serving up this superior coffee, which is steeped in cold water to create a sweet, smooth flavor and a higher caffeine content, making an all-around better beverage. Eater reported the coffee is already available in Springfield, MA and is expected in Portland and Bangor, ME soon. "The limited test will help us gather valuable feedback to determine whether cold brew fits within our long-range plans. Once the test is complete, we will carefully review feedback from both customers and franchisees before making any determination about a possible national rollout." Though nothing's for certain, this does give frequent coffee drinkers hope that one day they won't have to wait in line at some hipster cafe to get decent cold brew. The neighborhood Dunkin' will have you covered. Kara King is a News Writer at Thrillist and is three cups of coffee into this day. Send news tips to news@thrillist.com and follow her at @karatillie.